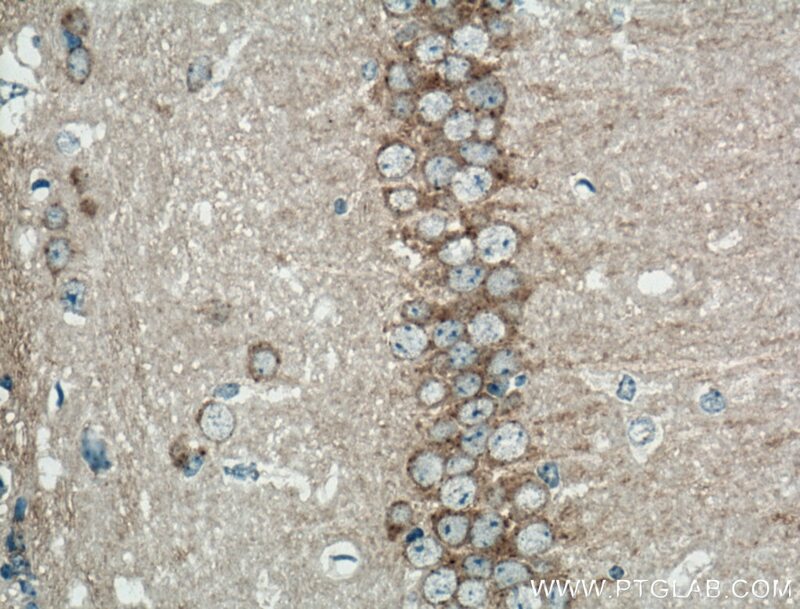 Immunohistochemical analysis of paraffin-embedded mouse brain tissue slide using 20358-1-AP (PRKAR1A antibody) at dilution of 1:200 (under 10x lens) heat mediated antigen retrieved with Tris-EDTA buffer(pH9). 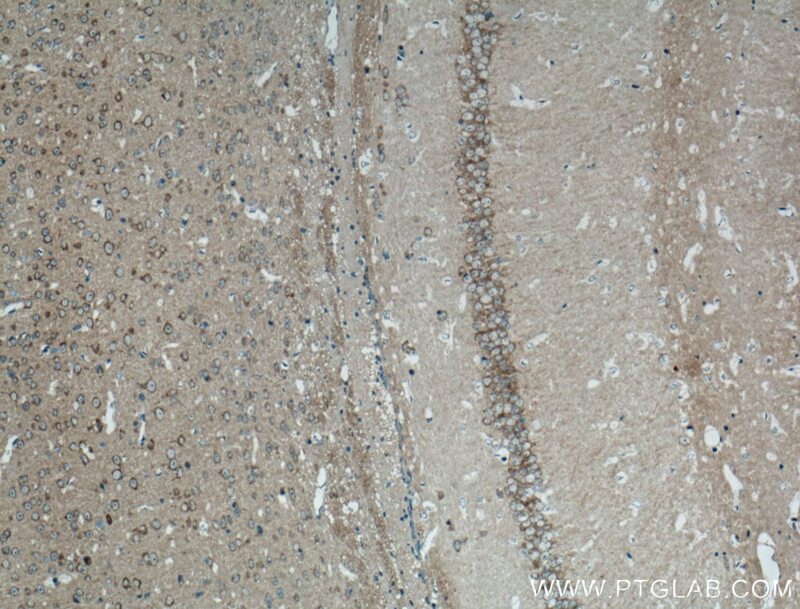 Immunohistochemical analysis of paraffin-embedded mouse brain tissue slide using 20358-1-AP (PRKAR1A antibody) at dilution of 1:200 (under 40x lens) heat mediated antigen retrieved with Tris-EDTA buffer(pH9). PKA is a heterotetramer inactive kinase composed of two regulatory and two catalytic submits. The regulatory subunits are encoded by four genes (PRKAR1A, PRKAR2A, PRKAR1B, and PRKAR2B). PRKAR1A, a gene coding for the cAMP-dependent protein kinase (PKA) 1α regulatory submit, is located on human chromosome 17q22-24. 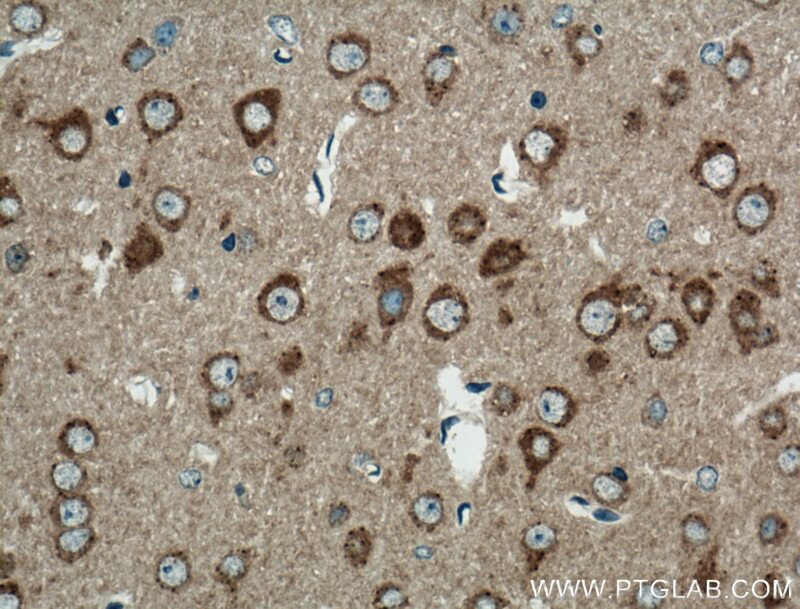 PRKAR1A protein insufficiency and PKA dysregulation have been implicated in various types of disorders, including Albright hereditary osteodystrophy (AHO), pseudohypoparathyroidism (PHP), acrodysostosis (ACRDYS), and Carney complex. PRKAR1A protein expression level was significantly dysregulated in multiple primary carcinomas and distant metastases, such as cardiac myxomas, odontogenic myxomas, anaplastic thyroid carcinomas, breast cancer, pediatric pituitary adenomas, and Schwann cell tumors.